I“To a teacher of languages there comes a time when the world is but a place of many words and man appears a mere talking animal not much more wonderful than a parrot.” Several such parrots (as well as the feathered one) in their various ways screech “Viva Costaguana!” in Nostromo. Readers of the Jury: I do not know who first compared history to the theatre (that distinction does not belong to me), but one thing is sure: that lucid soul was not aware of the tragicomic nature of our Colombian scenario, created by mediocre dramatists, fabricated by sloppy set designers, produced by unscrupulous impresarios. The specific charge upon which we are being asked to sit in judgement is not made absolutely clear until the final chapter, and one question in judging the novel will be, has it been worth the wait? Meanwhile, the reader familiar with Nostromo is likely to feel that the defendant in question is, of course, Conrad, and that the evidence shows him guilty of a very European appropriation of the tragedies, cruelties, and humanity of Colombia for a comic-opera rendition of some “typical” Central or South American state, a “performance upon the Conrad” that Vásquez’s highly performative novel unmasks as a species of theft. Be this as it may, the history of the secession of Panama from Colombia, with the inflow of foreign investment into the Canal and the part played by journalism in its announcement, provides some irresistible pointers to Sulaco, the Gould Concession, and the role of Decoud; and Vásquez’s determination to show Conrad’s unacknowledged debt to this brutal history of European and American capitalism provides the reader with a fast-moving narrative of battles, advances and retreats, incidents of cruelty, stupidity, and kindness, pronunciamentos, newspaper articles, ineffectual government, rascality, construction and destruction, to match the turbulence that sounds through Nostromo. Yes, my dear Joseph, yes: I was there, in Colón, while you were ... I was not a witness, but that, given the nature of our almost telepathic relationship, of the invisible threads that kept us on the same wavelength, was not necessary. Why does that seem so implausible to you, my dear Joseph? Don’t you know, as I do, that our encounter was programmed by the Angel of History, the great metteur-en-scène, the expert puppeteer? Fictionally, this identification becomes a means to explore a relationship with his journalist father – “idealist, activist, optimist” – who functions in the novel both as a Decoud figure and also as Apollo Korzeniowski. The death of Miguel Altamirano “by disillusionment, though I was prepared to accept melancholy,” in an abandoned excavator for the Panama Canal for which he has been so enthusiastic, is one of the most finely evoked, indeed Conradian, moments in the novel. More broadly, the assertion of identification between Conrad and his narrator Altamirano is also the means for the author Vásquez to explore the role of the writer in relation to country and nationality: for Vásquez, who lives in Barcelona, the insistent presence of Conrad the expatriate Pole bounding his literary horizon seems to demand this examination of the oscillations of loyalty and betrayal, those deeply Conradian concerns. Yet Conrad’s awareness of the irony of a writer airing this view permeates his work more tragically than is allowed by Vásquez’s procedure in his novel of having a first person narrator who must be the voice of this awareness as well as its victim. So his parenthesis – one of many – that “(Words pursue, they can wound, they’re dangerous; words, in spite of being the empty kind of words that Colombians tend to pronounce, can explode in our mouths, and we mustn’t underestimate them. )” is too explicit and, unlike the multiple parentheses in Nostromo, actually limits the resonances that operate within this narrative of history rather than extending them. At bottom, this is because of a condition that Conrad knew well – a lack of conviction in the reality of his characters. As Conrad wrote to William Blackwood about Lingard in The Rescue, “If after reading the part 1st you don’t see my man then I’ve absolutely failed and must begin again” (CL1 381). For Vásquez, this affliction becomes a multiplication of words at the expense of realised presence, and a multiplication of aims that diminishes the intensity that peculiarly arises from fiction. The constant declarations of method, as for instance, when he introduces the Colombian Envoy Extraordinary Pérez Triana (the real-life connection who will be made into the link between Conrad and Altamirano) with “The important thing is not who that man was, but rather what version I am prepared to give of his life, what role I want him to play in this tale of mine,” might count as “postmodern,” but their wearying explicitness is, in Conradian phrase, fatal to art. In fact, the best scenes in the novel – and several are briefly and vividly imagined – are given life by a modernist sensational immediacy rather than by making a foreground of the issues inherent in narration. The exception to this is a bravura eight-page history of a Chassepot rifle, one of the guns supposedly smuggled by the Saint-Antoine to Catholic conservatives, which operates as an implicit commentary on Decoud’s shipment of arms to Sulaco and, in its inventiveness, overleaps the boundaries between fiction and history at which, elsewhere, the novel strains. 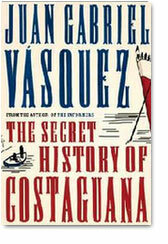 For Vásquez has a real gift, hinted in the later stages of The Secret History of Costaguana, for serious evocation of a personal plight and that of a country, but it suffers under the weight of a scholarly awareness imported to mediate playfully between history and fiction, which ends by stifling the direct force of the latter.